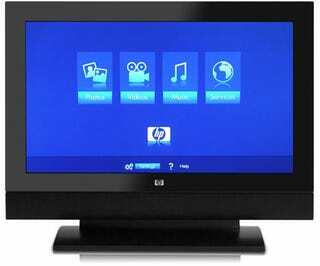 The HP SLC3760N 37-inch MediaSmart LCD TV is a 1366x768 flat panel display with an HDMI input and a couple of speakers on the bottom. So far it's pretty conventional, but it gets into the world of convergence when you hook it up to your network and then it can stream video, photos, audio and the Web from any computer in the house. Nothing special here, folks. It's pretty pricey for $2700, considering that you can get a LCD TV that's this same size and resolution for $1500 less, and then hide a cheap networked PC behind it running Windows XP Media Center Edition. More capabilities, $1000 less. HP must be aiming this MediaSmart product at the MediaDumb. Nice try, HP.